Hamilton musical – It's Hamiltime! Fishs Eddy offers this dueling gift box of Aaron Burr and Alexander Hamilton shot glasses on their website for $12. I received these as a Christmas present this year, and love them! They are very sturdy and well made (but be warned, they pour pretty large shots). 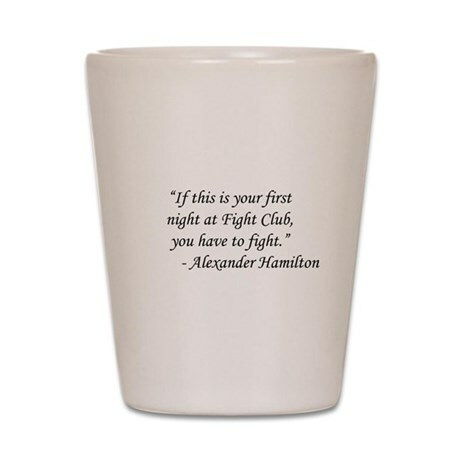 Cafe Press offers this Fight Club Hamilton shot glass, combining A. Ham + one of my favorite movies, for $13.99. 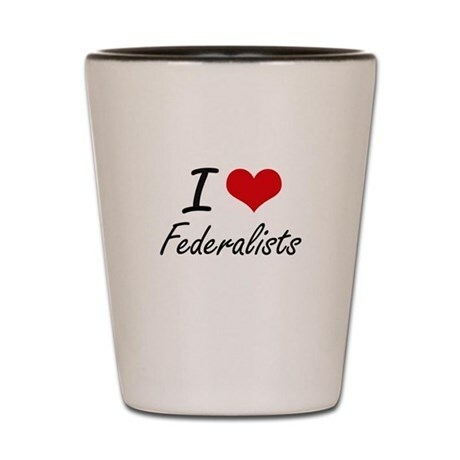 Cafe Press also offers this I Love Federalists shot glass for $13.99. As the Hamilton musical grows into more of a phenomenon, I feel compelled to celebrate its genius. I don’t have an acre of land, a troop to command, or a dollop of fame, but I can make a damn good cocktail. So here’s my way of adding my voice to the narrative: a boozy homage to the checkered, complex life of Alexander Hamilton, using spirits—rum, whiskey, cider, pimento dram, and applejack—that were popular during Hamilton’s lifetime.